I NEED TO...reduce user logon times. Want to reduce profile corruption? So did Deakin University. Hospital cut logon times by 87%. How? See how University of Texas Medical cut logon times "from minutes to seconds." It's true. In fact, research indicates that after a 30-second wait, 71% of end users will perform personal tasks for up to five minutes, costing the company time and money and leaving unlocked devices open to security breaches. In addition to decreased user productivity, protracted logon times can drive poor user acceptance of desktop virtualization and higher service desk call volume. Ending long logons builds end-user confidence in IT, reduces IT costs, and contributes to improved productivity for all. Traditional roaming profiles, logon scripts, and Group Policy Objects are the leading causes of prolonged logons. Eliminate them, and your users log on faster. How do we do it? Read the data sheet below. Monolithic profiles stored at logoff are prone to corruption. Instead, save and restore personalization only when it’s required. Instead of applying one bloated profile at logon, stream personalization just-in-time throughout the session. Using granular policies instead of cumbersome logon scripts speeds logons and gives IT more control. When GPO complexity spins out of control, logon times grow and users protest. Replace GPOs with fast, on-demand actions. Simplified, centralised, point-and-click policy management enables logon actions to be applied simultaneously, eliminating the need to sequentially load long, complex scripts at logon. Solutions from Ivanti eliminate the need to rely on traditionally bulky user profiles, unwieldy logon scripts, and complex Group Policy Objects—speeding user logons. End users get to work faster, call the service desk less often, and become advocates for IT. Environment Manager is a policy- and personalization-management tool that allows IT to fully personalise each user’s desktop, on-demand, without the need for cumbersome profiles or scripts—even in standardised desktop environments. With Environment Manager, users start working quickly without prolonged logons. 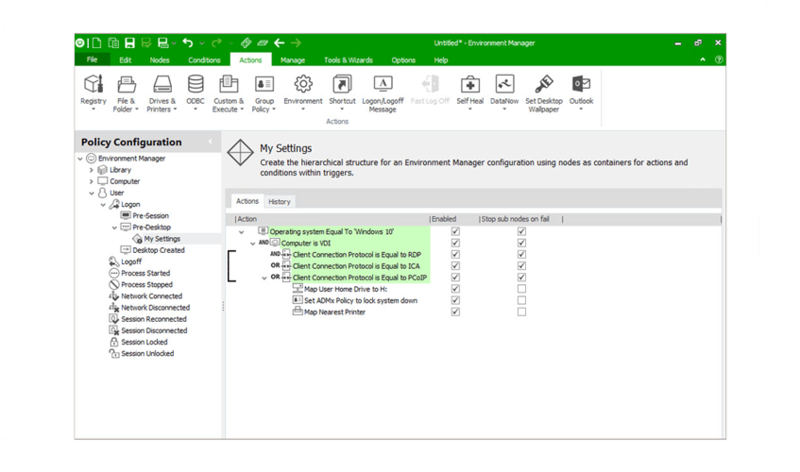 The self-service rollback capabilities of Environment Manager allow users to restore application and desktop settings to a preferred working state. This eliminates the need for IT to delete corrupted profiles and the resultant user downtime. IT can define granular policies that adapt based on context, using a scalable, point-and-click interface. In addition, Environment Manager captures all user-specific customizations to the operating system and applications as they happen. Environment Manager replaces cumbersome logon scripts with fine-grained policy that is applied based on context. The user logs on as fast as possible to a consistent desktop. Rather than utilising monolithic, corruption-prone user profiles, Environment Manager stores user settings on a per-user, per-application basis in a highly scalable infrastructure that streams personalization on-demand to any Windows platform. 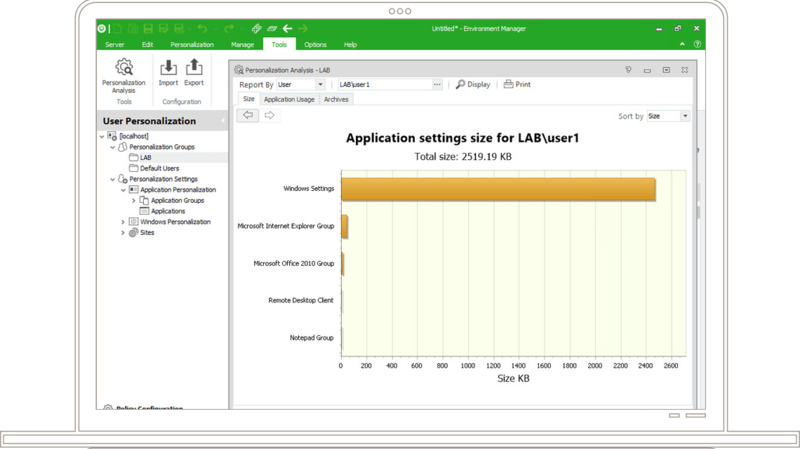 Environment Manager decouples user data from the desktop environment and manages this data independently of the device. A point-and-click, parallel-processing engine centralises policy management without relying on logon scripts or GPOs.